Sunset Watersports - The Best Deal In Town! 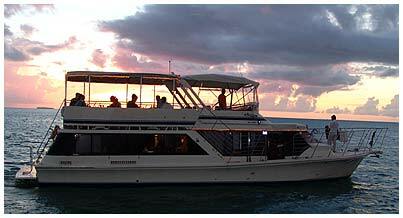 Sunset Watersports features an excellent combination sunset dinner cruise for just $69. You can even save an additional $10 if you book on-line. We haven't found a better bargain for a Key West dinner cruise. 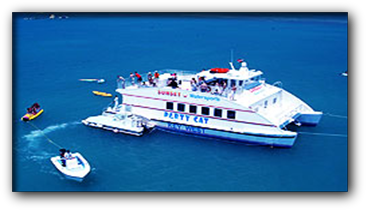 You'll get a fantastic view of the famous Key West sunset on their state of the art cruise ship, the Party Cat. The Party Cat features two full bars, DJ & live music, a lighted dance floor and air conditioning to make for an enjoyable evening of song and dance. unlimited drinks including; Margaritas, Rum Drinks, Well Mixed Drinks, Tap Beer, Various Wines, Bubbling Champagne and non alcoholic beverages. 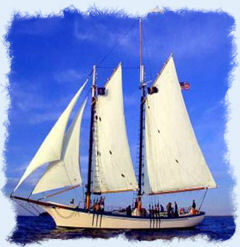 Sunset offers what many consider to be hands down the best Key West dinner or sunset cruise value on the island. If you book a cruise you will want to make sure you arrive at 201 William Street and check in at least thirty to thirty five minutes before the scheduled departure time. Aquatic Boat Rentals - Custom Sunset Tours. Aquatic Boat Rentals offers a custom sunset cruise. Their 24' Hurricane deck boat can accommodate up to ten people, which costs $50 per person. You are invited to bring along your favorite beverages and food. The tour departs from the Cow Key Marina a few hours before dusk. You will have a great chance to view a spectacular sunset from the west end of the island and you won't have to worry about the crowds at Mallory Square. If you have a group of people who would prefer a more private setting without the frills then you may want to book a sunset cruise with the folks at Aquatic. There is no absolutely no better way to savor the sights and sounds of Key West Florida than spending time on a dinner cruise with Islescapes. Indulge yourself with world class cuisine, fantastic service and the some of the best scenery the caribbean has to offer. Islescapes features a thirty three foot remodeled boat that is perfect for any special occasion including weddings or maybe just a casual evening out to enjoy the famous Key West Sunset. Islescapes is one of the better dinner cruise ships in the Keys! Dream Chasers Charter Inc - Let Captain Ken Entertain You. Their forty three foot trimaran, Dream Chaser, will provide you with the perfect setting for that Caribbean cruise that you've always dreamed about. The ambiance of the ship and personalities of Captain Ken and his sidekicks (crew) will make for a fun and enjoyable evening. Music, wine, beer and sodas are all included with Captain Ken's four course meal. The voyage will last approx. three hours and you will get to view Key West and the surrounding area. They would sincerely enjoy having you to be their guests. Never seen a Key West sunset! 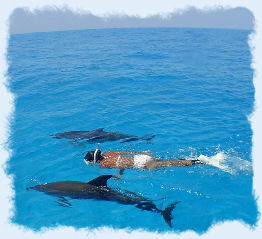 Come experience what many before you have described as the highlight of their Florida Vacation. Sunset Culinaire offers a more refined Key West dinner cruise experience. They offer a three course dinner prepared by Chef Brian Kirkpatrick, who was a successful and former chef at a classy four star hotel. The dinner includes a host of entrees that you would find at a more upscale restaurant. Four larger groups they will also offer a custom menu to fit your palate. The price of the dinner cruise is $85 and also includes wine and beer. Reservations are a must and you will be able to save an additional $10 if you book on-line with them. The sunset cruise will depart from the Sunset Marina which is located across from the golf course on Stock Island. You will need to call to get their exact departure times. 1800 Atlantic Resort - Key West's Number One Resort Vacation Property!